What’s a Tough Mudder? Contestants will tell you it is the TOUGHEST one day event on the planet. This is not your average mud run. These 7 to 12 mile obstacle courses are designed by British Special Forces to test all around toughness, strength, stamina, fitness, camaraderie & mental grit. Simply completing the event is a badge of honor. Not everyone finishes, but those who do will have truly earned the right to call themselves a “Tough Mudder.” This event is held over Memorial Day Weekend at Snow Valley, which is about 10 miles from Big Bear Frontier. Big Bear Frontier is honored when we have the opportunity to host contestants from this event, which we did this year. During their stay they shared details with me, and some admitted they could not make it to the finish line. I heard accounts of contestants with hypothermia and reports of bodies turning blue. Like I said, this event is tough! One contestant has a close Big Bear Frontier connection. 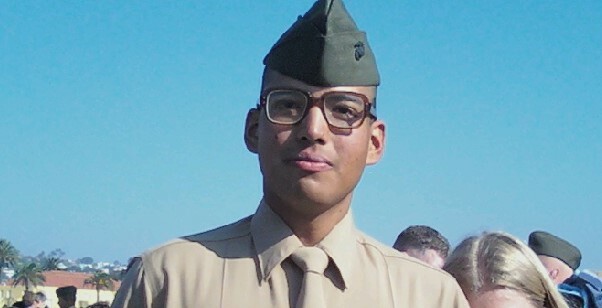 Our Maintenance Supervisor’s son, Sergio Rodriguez, Jr., a United States Marine, completed the obstacle courses this year. He said that at the 5th mile of the course he began to lose his senses, hypothermia set in and that it was tough to keep going. He described some of the courses to me which I’ve outlined here for you. One 20 foot course consisted of four pressures hoses of freezing cold water blasting on the contestants. Does that sound like fun? How about the Boa Constrictor Event which is a long tube full of course sand which contestants must crawl through, then enter another 25 foot tube of muddy, cold water. Sergio said that the worst obstacle for him was the “Death March.” In this course contestants climb steep, rocky terrain and because of the foot traffic rocks the size of bowling balls tumble down the mountain, often hitting the contestants. If you aren’t in front you are getting hit. Of course, you are also sending rocks down to those folks below you. For those not familiar with the area, Snow Valley is at an altitude of 7000 feet. Sergio recalled that when he reached the top of the mountain there was nothing but ice. The “Funky Monkey” is 40 feet of frozen monkey bars so cold you they are impossible to grip. Sergio says he made it through that one by using his feet, which was allowed. Out of all these grueling events Sergio told me that the “Electric Shock” was the most fun for him. This 20 x 10 foot space is filled with live electric wires which hang down randomly. Contestants jump through bales of hay that sit in about a foot of water and attempt to miss the wires. Sergio had one wire touch his shoulder sending about 10,000 volts of electricity through his body. Fun, huh? While all this sounds awful for most of us, Sergio reminded me that the Tough Mudder is really about experiencing a sense of camaraderie that is rarely seen outside of the military. Many of the obstacles require the help of your team. Tough Mudders are just as concerned about making sure no one is left behind as they are about their race time. Congratulations to Sergio and to anyone who made it through this exercise of what sounds like self-torture. By the way – Sergio slept 16 hours non-stop after the event. Do you know a Tough Mudder? Let us know here! Gallery | This entry was posted in News and tagged Big Bear CA, big bear lake, Snow Valley, Tough Mudders. Bookmark the permalink.